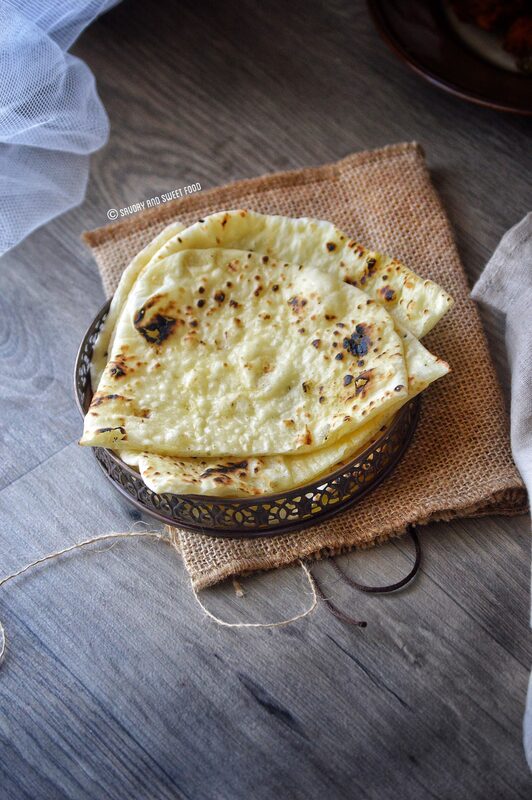 Butter Naan, a butter flavored Indian flat bread which goes very well with any sort of curry, as a pizza base and also as wrap for sandwiches. Who doesn’t love homemade bread, Im sure most of you do. I personally love homemade fresh bread even though I get very lazy to make them. :D This one is actually very simple to make at home, just any time. 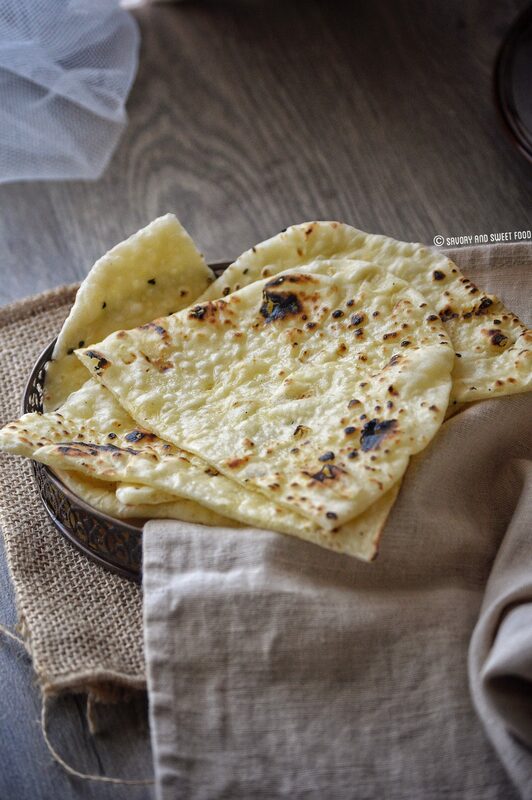 If you are unfamiliar with naan bread, it is an Indian flat bread with is made traditionally in a tandoor. But it can be made on stove top too. It resembles pita bread a lot. Like pita bread, naan is also leavened with yeast. But nowadays people replace yeast with baking powder to make instant naans. 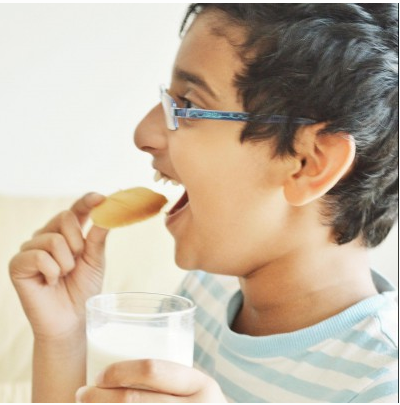 While making the naan dough, milk/yoghurt is used which gives that distinct flavor and softness to the bread. Naan is usually served hot smothered in butter or ghee. Doesn’t that sound great? I love naan especially with nice and thick Butter Chicken. But nowadays I am seeing a lot of naanwich (Sandwich with naan bread) and naanza (pizza with naan) recipes all over. So I have kept half of the dough in the freezer to try them out sometime. I will let you know how it turns out. 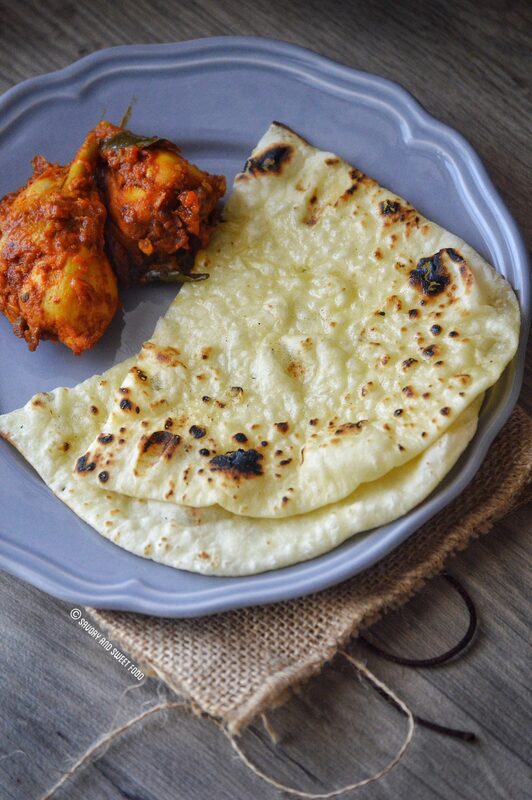 For now get the recipe of this amazing soft and fluffy butter naan. Here it is. The dough has to be very soft, only then you will get soft naans. Its ok even it is a little sticky. Just use more flour while rolling it. If you like thick naan, then do not roll the dough very thin like how I did. 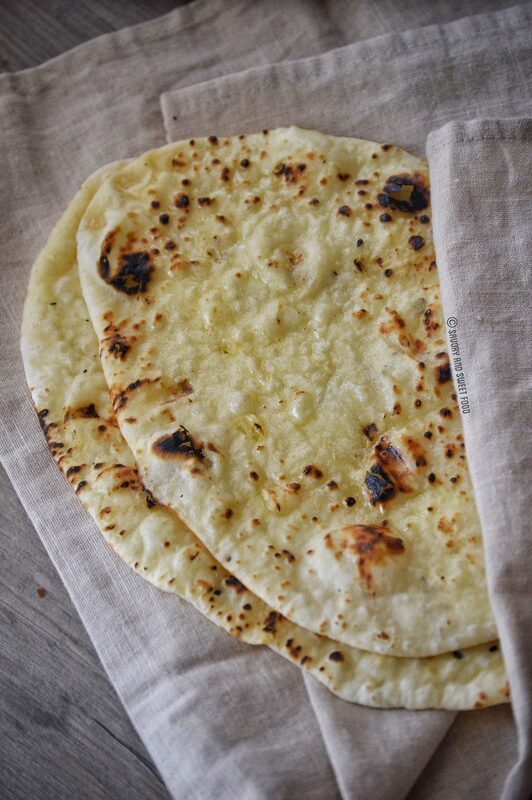 But at the same time do not roll the naan very thick because the bread tends to shrink and bounce back when you place it on the heat and finally giving you a very thick bread. First mix the dry ingredients, which are maida and salt in a bowl. Mix well. In a sauce pan combine water and milk, heat till slightly warm. In another bowl, add in yeast and sugar. Pour the warm milk mix into this. Mix well till dissolved. Add in the egg. Mix. Then pour oil to this. Pour this entire liquid mix into the dry ingredients. Stir well with a spoon till everything comes together. The dough will be very sticky at this point. Add in 1/4 cup of maida, knead with hand. If the dough is still sticky (which I am sure will be), add in the remaining 1/4 cup of flour. Knead again. You may need to add in about 2 more tbsp of maida if the dough it still very sticky. But keep in mind that the dough has to be soft, only then you will get soft naans. Keep the dough covered in a warm place to rise for about 2 hours. Punch down the dough and divide it into 10-12 balls. Let it stay on the counter covered for 15 minutes. Roll out the dough thinly into an oval shape by sprinkling maida on the counter. Spread black sesame over it and roll it slightly till the seeds get stuck onto the dough. Heat the tawa/griddle on high heat. Once it turns very hot add the rolled naan with sesame seed side facing up. Once the bottom gets browned slightly, flip it onto direct flame, Let the naan get charred black spots all over it. Keep on moving it till it gets equally charred everywhere. Remove from fire and spread butter all over the hot naan. Serve. Heat the tawa on high heat. Once it turns very hot add the rolled naan with sesame seed side facing up. Can v substitute powdered milk for fresh milk? Also any substitute for yeast?